Surface measurement systems (SMS) allow accurate measurements of surface geometry for three-dimensional computational models creation. There are cases where contact avoidance is needed; these techniques are known as non-contact surface measurement techniques. To perform non-contact surface measurements there are different operating modes and technologies, such as lasers, digital cameras, and integration of both. Each SMS is classified by its operation mode to get the data, so it can be divided into three basic groups: point-based techniques, line-based techniques, and area-based techniques. This chapter provides useful information about the different types of non-contact surface measurement techniques, theory, basic equations, system implementation, actual research topics, engineering applications, and future trends. 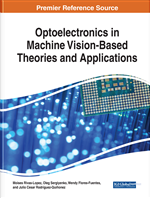 This chapter is particularly valuable for students, teachers, and researchers that want to implement a vision system and need an introduction to all available options in order to use the most convenient for their purpose. Surface measurement systems in its common definition is the possibility of a machine (by sensing means and computer mathematic processing consecutively) to obtain information about surrounding environment for further analytical treatment. According to the common definition, any complete surface measurement system or machine vision system is a combination of two components: technical means (hardware) and information processing mathematics and algorithm (software), (Rivas-Lopez, Sergiyenko, & Tyrsa, 2008). Surface measurement systems are related to many fields, techniques developed from different areas are used for recovering information of objects like image processing, where its algorithms are useful in early stages of surface measurement systems, curve and surface representations and other techniques are used from computer graphics, also, computer graphics uses many techniques from surface measurement systems to enter models into the computer for creating realistic images. Other area is pattern recognition, where many statistical techniques have been developed for classification of patterns, artificial intelligence is used to analyze scenes by computing a symbolic representation of the scene contents after the information has been processed to obtain features (Cuevas-Jimenez, 2006). In this chapter a compilation of non-contact measurement techniques are presented, they are divided according to their mode of operation, also, the working principle, basic equations, system implementation and future trends are shown and how all of these techniques can be implemented together to improve the performance of the vision system.